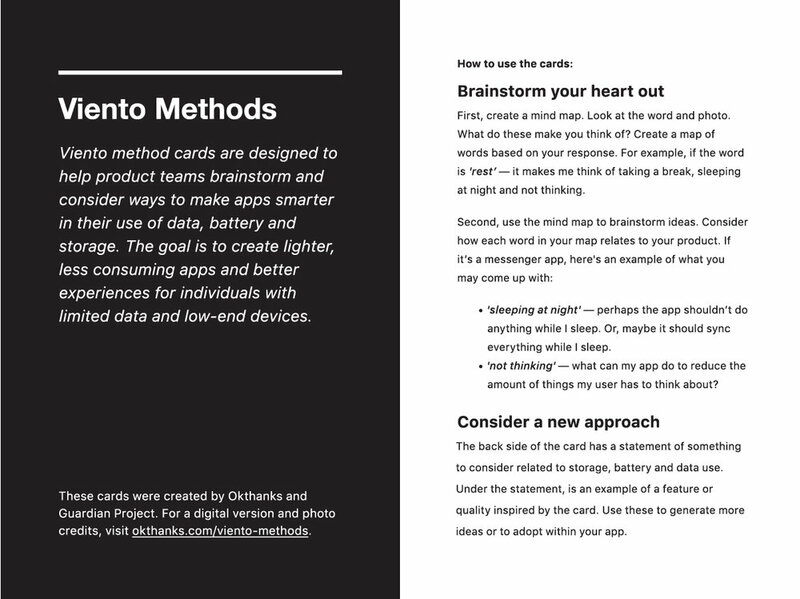 Viento method cards are designed to help product teams brainstorm and consider ways to make apps smarter in their use of data, battery and storage. 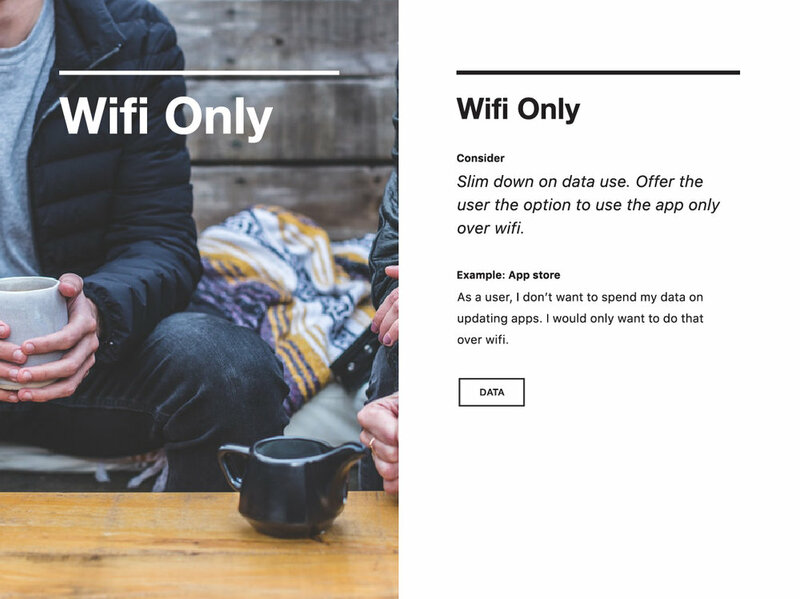 The goal is to create lighter, less consuming apps and better experiences for individuals with limited data and low-end devices. LEFT SIDE (PHOTO) - BRAINSTORM YOUR HEART OUT! Look at the word and photo. What do these make you think of? Create a map of words based on your response. For example, if the word is 'rest’ — it makes me think of taking a break, sleeping at night and not thinking. 'sleeping at night' — perhaps the app shouldn’t do anything while I sleep. Or, maybe it should sync everything while I sleep. 'not thinking' — what can my app do to reduce the amount of things my user has to think about? 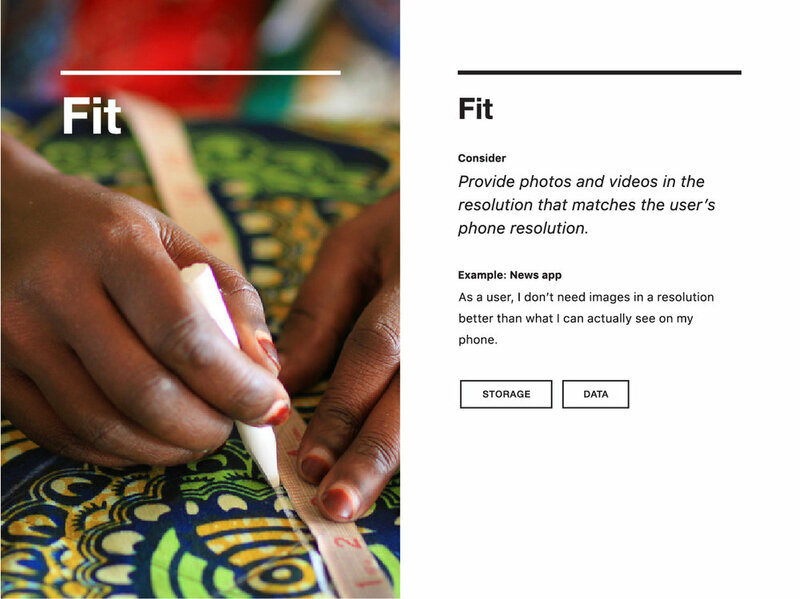 This process can inspire new smart qualities for your app. The back side of the card has a statement of something to consider related to storage, battery and data use. Under the statement, is an example of a feature or quality inspired by the card. Use these to generate more ideas or to adopt within your app. These cards were created in partnership with Guardian Project.